After the snow came the thaw and then this morning the sunshine so we decided that it was time for a family day out. We live in London so can visit lots of the major tourist attractions in UK on a whim. 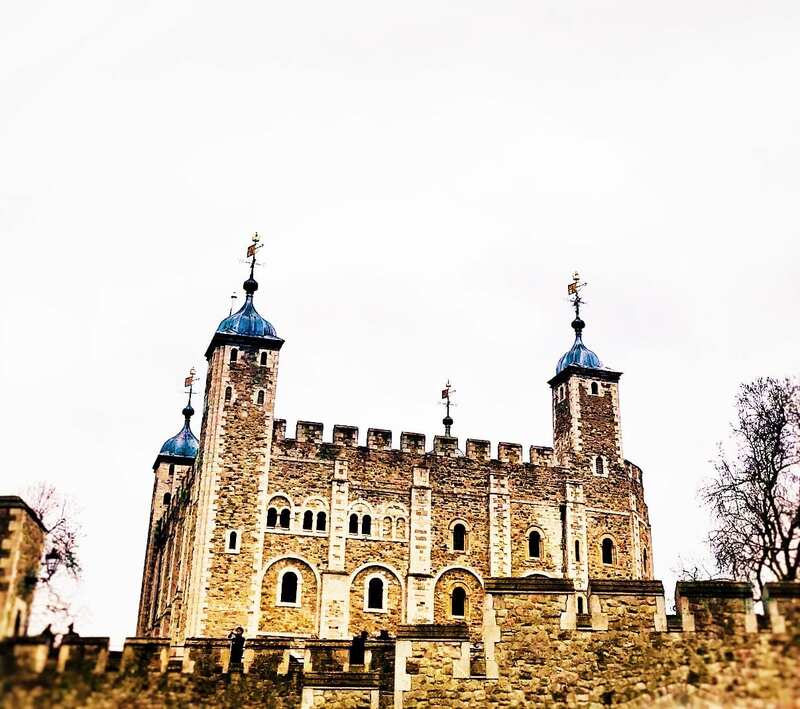 Today we decided to head to one of our family favourites the Tower of London and as usual fun was had by all so I thought I would write this about what is good about this and some of the ‘locals’ tricks that we have learnt along the way. The first thing to say about the Tower of London for families with young children is that you can still walk around some of the Tower with your buggy although there are a lot of cobblestones so it might get a bit bumpy. They have definitely thought about families, but it is an old building so of course isn’t entirely accessible. You can go into the Crown Jewels, see the guards and the ravens with a buggy. You will not be able to access the tower walls or the White Tower with a buggy, but for little kids these tend to be a tough walk with steep uneven steps so you might not want to anyway. They do have buggy parks in the Tower of London where you can lock your buggy up with a big metal chain. Do you need a £1 coin which comes back to you after use. What we tend to do is walk around all of the accessible parts first and then if the troops are not sufficiently castled out park up the buggy and brave the stairs. When they were very little we would simply bring along a baby carrier and ditch the buggy as soon as we entered the tower. On the grass, in front of the White Tower, you will find actors dressed as Knights, Lords, Ladies and Kings depending on the day. When we went today they were performing three times in the day and each performance was 35 mins, but in the Summer holidays I have found that there tends to be even more going on. Once the boys even got to see a jousting demonstration. Even today on a day that promised sunshine, but ended up rather grey the actors stopped to talk to the children (always remaining in character) and thrilled them with tales of swords and knight’s training. We didn’t see the actual performance today, but they always involve much audience participation and teach the kids (and the adults) about a historical event that took place at the tower. This week for example it is called ‘Defend the Tower’ and you the audience have to help the heroic guards defend the castle against its enemies. There is now an app that you can download in advance of your visit which opens up a digital mission for the children to do on their visit. There is a problem to be solved and the children have to do so during their exploration of the castle. They also have family trails which can be downloaded from the website (link included) Family Trails Download are filled with quizzes and activities along with fun facts for the children to do during their visit. Honestly we have never found that we need them they just love the place! 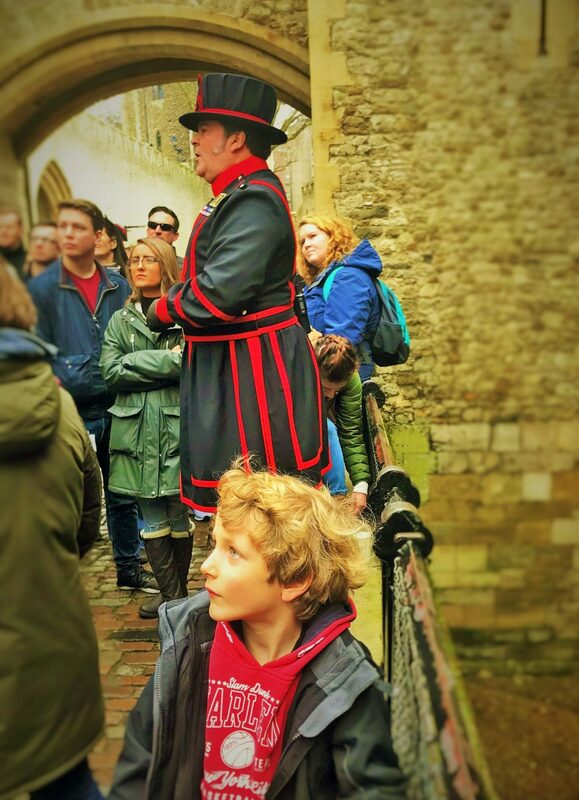 Several times a day there are guided tours of the Tower of London given by the Yeoman of the Guard (Beefeaters). This tour is included in the price of the ticket and is totally worth the ticket price alone as it is fascinating. History gives us the most unbelievable stories and no where (in my opinion) is this more true that at the Tower of London which has such a dark and gruesome history. If your child likes the Horrid Histories series then this is sure to be a winner, but don’t worry it is not in the least bit graphic in its descriptions of the horrid things that befell the victims of the Tower so you won’t need to be dealing with kiddie nightmares. There will be Ravens about the place as you walk around Tower, but if you turn left after going through the port coulis then you will also see the cages where there will always be at least one Raven hanging out. I believe they take it in turns for the myth is that were the Ravens ever to leave the Tower the monarchy would fall and no one is taking any chances! If your little ones love amour, knights, weaponry etc… then this is the place for them. It is packed full of it and there is a lot to see, but beware there is one way in and one way out (it is a bit like Ikea as you have to go one way round) In the summer it can get very busy. There are also lots of stairs. I once attempted this, at the boy’s request, but against my better judgement, in the middle of summer with a 3 year old and a 1 year old. Don’t do this! The 3 year old threw a large wobbly half way up as he had had enough and we were rather stuck! Ultimately I had to plead with a member of staff to help us and we were let out via a fire escape, but they didn’t seem that thrilled to be doing so. I would say this part of the experience is probably best for those 5+ unless you are able to give them a carry if they start to flag. It is really interesting though and there is lots for kids to get excited about including an enormous dragon made out of amour and supposed to be guarding the mint. My kids love a bit of bling. The boys always long to have the small really sparkly crown that belonged to Queen Victoria, but that is just one of multiple crowns, sceptres and bejeweled swords that are available to view. The huge ‘safe like’ doors are about half a metre thick and they are enough to keep my boys fascinated for a good while. There are also video presentations about coronations etc… which are clearly designed so that everyone who goes in has something to do and is slowed down a bit. This does not slow down my lot and I am yet to see these videos despite having been there at least 20 times at this stage. If you want to see the Crown Jewels I recommend avoiding the summer as the queues are so very long. We often go on a Sunday morning soon after the Tower of London opens and we just walk straight in. I would say these are worth seeing, but unless you are never going to come back I wouldn’t queue for an hour or more for the privilege. Watching the guards switch their guns from side to side and march up and down outside of the Crown Jewels is where my kids tend to want to spend most of their time. There is also a changing of the guard, but for us this can be a bit hectic trying to manage four little kids and the tourists descending in a panic that they might miss something so we tend to avoid that. 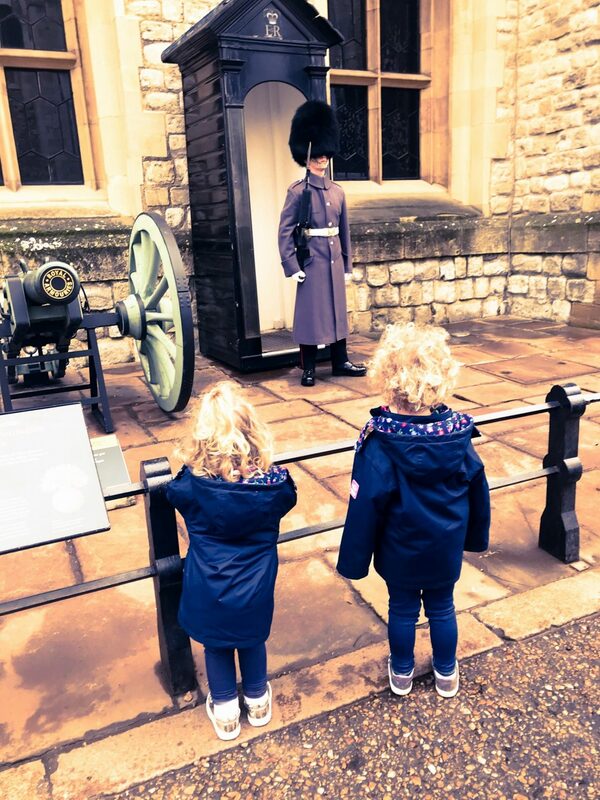 There is only a narrow railing between the kids and the soldiers at the Tower of London and they just find it totally fascinating. As mentioned before this is not part of the day that works well with very little toddlers or when you are outnumbered by toddlers as we were in the past, but from around 2 or 3 depending on how good they are with walking you can at least enjoy part of this experience. The views across the river and of Tower Bridge are great. You also get taken through the various towers along the way and within each one you learn something else about the history of the Tower of London. There are interactive bits along the way too. My kids just like the idea of walking around the castle walls. When the boys have been to the Tower of London with daddy on their own this is all they have wanted to do and have passed a couple of hours going back and forth around the walls. For our kids (and probably most kids) a trip to the shop and the cafe is a must. So first to the cafe… They do a kids lunchbox for around £5.50 and in this they can choose a sandwich (either Cheese or Ham), a drink (orange juice, apple juice, fruit shoots or water) and then select three other items. There is quite a choice; fruit pots, cherry tomato, crudites, hummus pots, crisps, raisins, jelly or bananas and custard. Our two year old twins can easily share one box and I just buy one extra drink. Even our 6 year old can’t quite finish it all so I would say it is good value. The quality of the ham and cheese also looks good. It is not that plastic ham so I am happy to let them have a box something which I wouldn’t say at all family attractions. The quality of the adults food is also good. I do think that is quite expensive though. They also do a good Latte and that has me sold as caffeine is usually essential after chasing my lot around for a while. Now to the shops. Beware there are at least three! Actually they do have some nice things in them and there always seems to be things on sale although these do seem to mostly be in the ‘girls’ part of the shop which is glaringly pink and sparkly. I think we now own much of what they sell and in the main it lasts well although we have found the wooden swords not to be too sturdy. Consider an annual membership. Even if you are only coming to London for a couple of days you could save money by buying this. A family memberships cost £105 for the year and includes two named adults and up to 6 children. On the door a family ticket is around £75, but this is a one off entry. If you bought a membership you could also visit Kensington Palace, Kew Palace or Hampton Court Palace whilst in London. It does also include other castles in the UK and Northern Ireland so might be worth it. You would need to buy this in advance though. If you plan on visiting more than once in a year then 100% buy an annual membership. If kids are under 5 years old they are free so you can even just buy a single membership for you or a joint one for mummy and daddy. These are £52 and £80 per year respectively. Annual membership also gives you 10% discount in the shop and the cafes. Look out for the ‘spooky hand’ as you enter the tower it is on the left hand side encased in the wall. I think it is actually called the severed hand. My lot can never wait to see it no matter how many times we go. 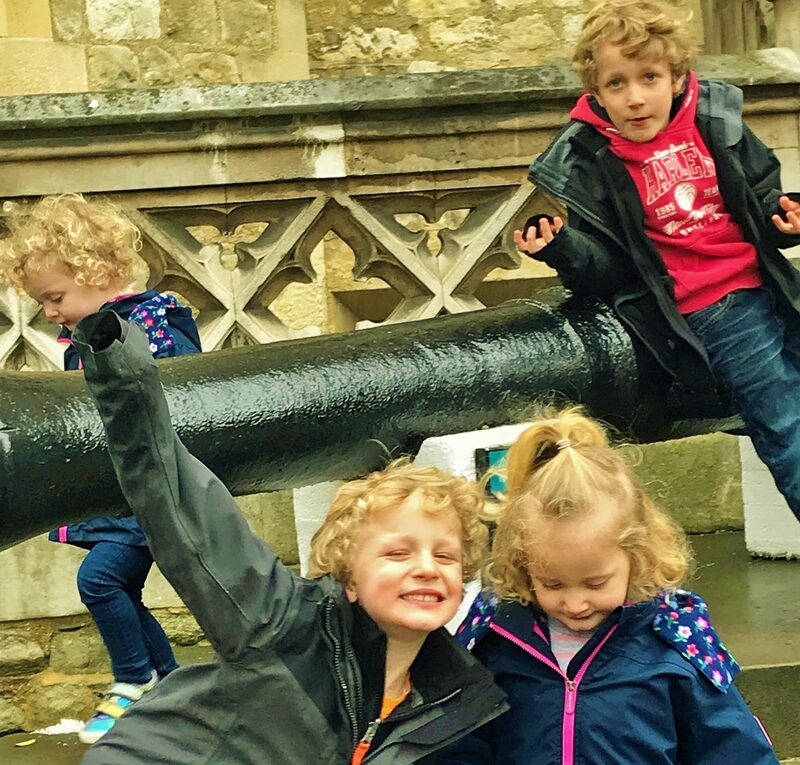 To make the day trip even more exciting for the littles why not hop on a river boat on the way back and get the boat either to London Bridge, Waterloo or Westminster. Another great route is starting at the Emirates Air Line and getting the cable car across the river. You can then jump on a river boat to make your way to the Tower of London and you will pass under Tower Bridge arriving just down from Traitors Gate as so many have before. As you may be able to tell I really love the Tower of London. To be honest I always have. History was my favourite subject at school and the first time I went there on a school trip I could almost feel History coming alive. It is amazing to see the same thing happening for my children and I highly recommend it. They are fairly obsessed my all things knights and so next on our lists are the jousting next time it is on at the tower and an overnight glamping session at the Knights Village at Warwick Castle which sounds right up their street. Perfect place for a day off.